I’m sure that this block has another name…they generally do. But every time I look at it I recall the wretched hair found on metro guys circa 1999. Think ‘N Sync, Nick Lachey, Mark McGrath… But I digress. 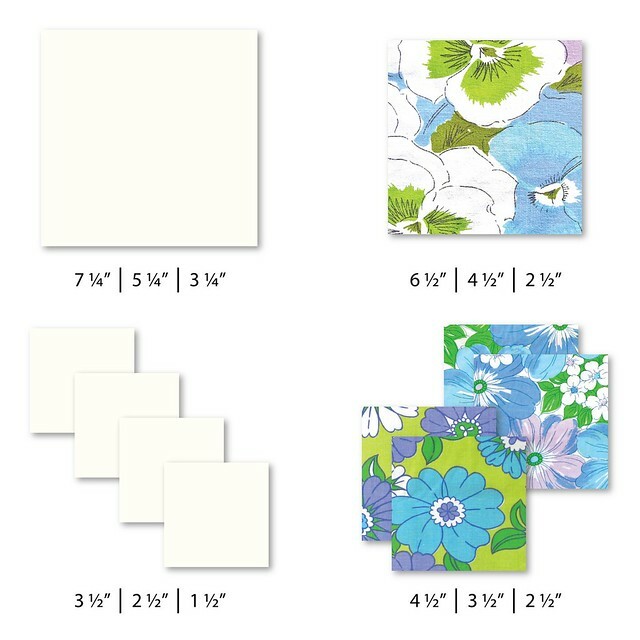 The points are made up of at least two different fabrics, although you could always use four for a really scrappy look. 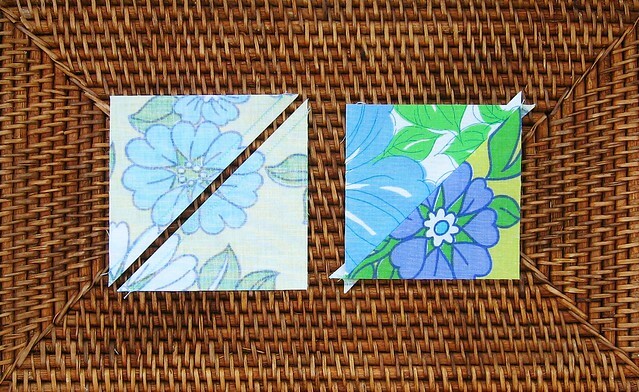 In my example I used two, so I cut two (2) squares of each fabric. 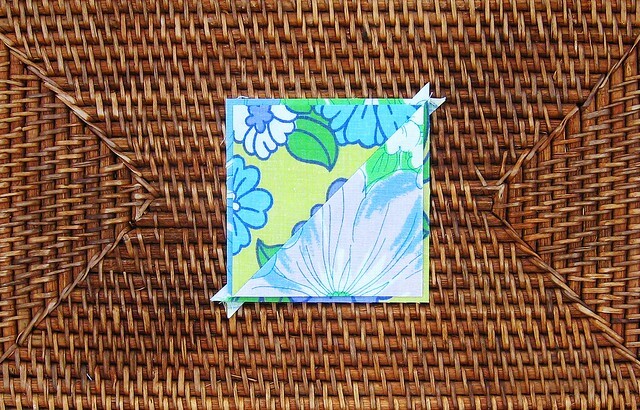 Start by marking the back of the squares from one of the fabrics, either with a single line down the centre, or a 1/4″ line on each side of centre. 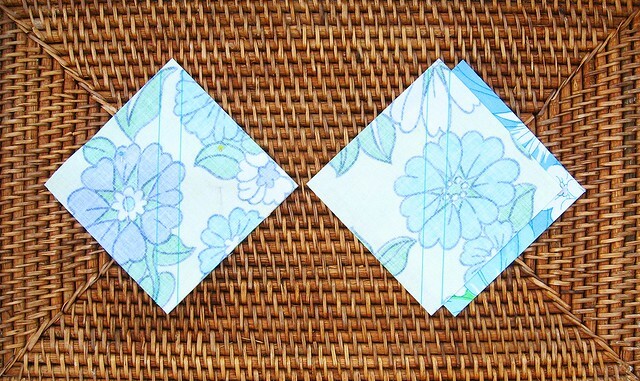 Then pin them to the other two (2) squares, right sides together. 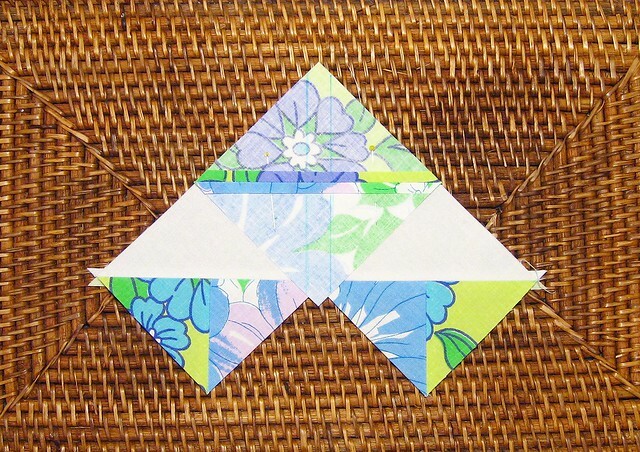 Sew along the marked lines using scant 1/4″ seams. 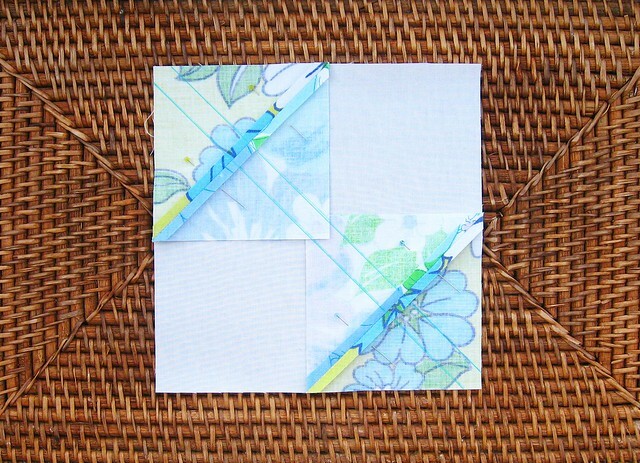 Each square will have two (2) stitched lines on it. 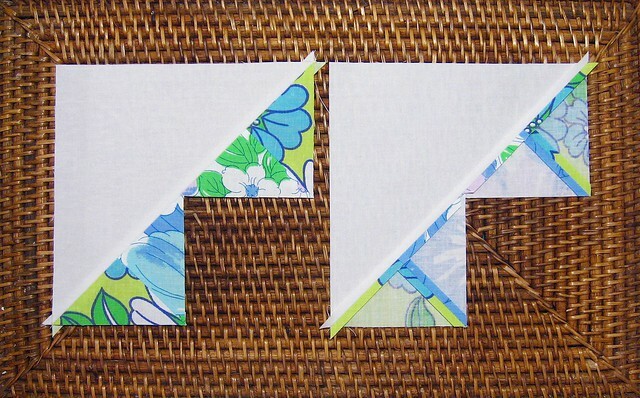 Then cut down the centre between your two seam lines to produce two (2) separate pieces, for a total of four (4) HST square units. At this point, making the four (4) flying geese units is exactly the same as for the basic star, but extra attention is required for the placement of the HST units to insure the the same fabric ends up on all the tips. The fabric which you wish to have appear on the tips needs to be the one which meets the corners of the background fabric, at opposite ends in the photo below. When you’ve sewn the two stitch lines using scant 1/4″ seams, cut the two resulting units apart and pressed both parts, be sure to remember to trim the little bit of excess where all the seam allowances meet in the centre. I forgot when I was making up my dummy block and it was really bulky! When you place your HST units for the next stage, make sure that the three fabrics which are overlapping in the centre are all the same, and that the three fabrics at the tips are all the same. 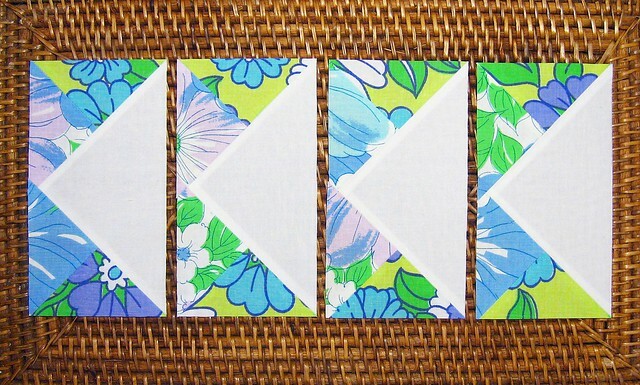 Again, once you’ve sewn, cut, pressed and trimmed, you should have four (4) identical flying geese units. 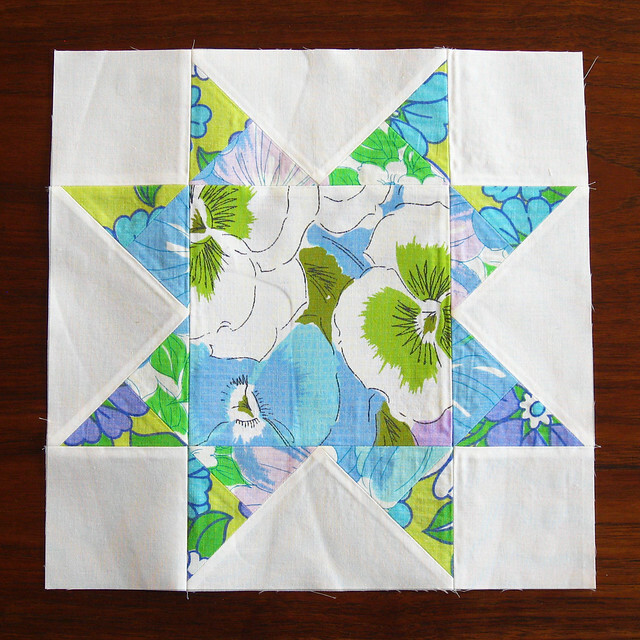 Sew all your remaining parts together (as per the basic sawtooth star) and press your finished block! One thing I have to say is that while the three fabrics I picked appeared different enough in large pieces, once put together I think they match a bit too well! So my advice would be to try for a tad more contrast than I achieved here. I’m going to play a bit this week as I finish up the other sizes, so I’ll be sure to show you some other ways to arrange fabrics in the block as soon as they’re done. Yay and easier one :) Thanks for sharing the tip on the contrast. Looking forward to see what everyone comes up with on this one.